How the Wall of Respect Became a Reality In 2007,.. Inspired by this report, soon after is was published, our local chapter of The Arc launched an initiative to do our part to hasten the progress. 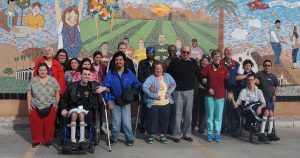 “The Value of One” is our affirmation that all people, with and without disabilities, have inherent value. This campaign has many initiatives including an effort to join forces with other organizations to end the “R” word and replace it with another “R” word: Respect. Another initiative proposed was to use a wall on our property to make a visual statement to illustrate our above beliefs. Thus the concept of The Wall of Respect was born. Two years ago, we began looking for the right artist to create a large mural to make this visual statement that could be seen by those visiting our location and anyone else interested in our campaign. We were fortunate to find accomplished mosaic artists: Erin Maxell and her parents. This Wall of Respect is an important part of the City of Riverside and contribute to its growing reputation as a city of arts and innovation.